Willem, where are you when you are not teaching class of DA and we miss you? Well, quite often now for the last few years I’ve been going to the Canary Islands! The first time I went, was to regain my sanity and get away from it all. But I kept going back and the last few years I‘ve been playing with the idea to do something with dancing on the islands. It’s like the European Caribbean: There is a lot of Latin music, a lot of dancing, it has a big local and both touristic community that love dancing, so there is quite a developed nightlife. Besides that, the weather is always great, it’s only a four hour flight and you pay in euro’s, only half the price! And the absolute killer for Dutch people is, there are no mosquitoes!!! You and the Canaries, it’s like a romance.. The first time I went there I was burned out. I pointed out somewhere on the map to go to: I wanted to go some place new, it had to be an island, reachable and in the tropical island zone. The Canaries are all that. I immediately felt like: this is it! That first time there I did a lot of walking and soul searching. It felt like the island nurtured me. I kept going since then. Every time I go to the islands, it’s a strange feeling of coming home. Now you bring your two passions together: dancing and the Canary islands. I thought if I love it there so much and I love zouk, then a lot of people who love zouk might enjoy the islands too. Last year I’ve been teaching a few classes there and meeting with some organisers and the idea was born to organise a dance holiday, combined with the possibility to see the island and do activities as yoga. People get the best of everything: nature, holiday and zouk(lessons). I really look forward to this time! This year we go to Lanzarote and Fuertaventura and next year we are thinking Tenerife. Every island has a distinct character. Lanzarote has a volcanic, black rock scenery. Fuertaventura is adjacent to Lanzarote but has sandy beaches. It’s amazing how diverse the islands are, there is a lot to see. Even though the islands are not very big, they have different climatic zones. I guess this is one of the reasons why athletes choose that destination to do their sport retreats. The zouk Yoga Retreat is a first?! It’s the first time for us and probably also a new concept. There are zouk retreats but the combination with yoga, especially in the Canary Islands is definitely the first one. Also in general, I have not seen the concept before. For me there is an obvious connection: in yoga, focus is on contact with yourself, in zouk on contact with each other. Both zouk and yoga focus on movement; large movement and conscious movement. People who practise both see the advantage it does for both. What is the connection with the embodying weekend? What we normally do in the Embodying Weekend (EW) are very intensive classes in very few days, where we break down your natural defences against new information and break down your barriers. In the Zouk/ Yoga retreat we hold a maximum of five hours of classes a day. Everything is more mindful, so there is time to let it settle. We do the same hours of classes but we have a double amount of days. I like to see it as a zouk holiday that is enriched by yoga, island and atmosphere. What do/ should we sign up for this summer? There is a combined program, carefully put together by us in collaboration with local dance schools and yoga studio’s. Next to the classes, we will go on some excursions, we will enjoy socials together like a bbq and a zouk beach party, there is time for surfing during the day, or to relax on the beach. We have various options for accommodation: to share or choose a more private stay. Sometimes the island can invite you really to be with yourself and with nature, so we want to leave space for that. I think we created a package that people want to join in with everything, but there is space to enjoy it as you like. 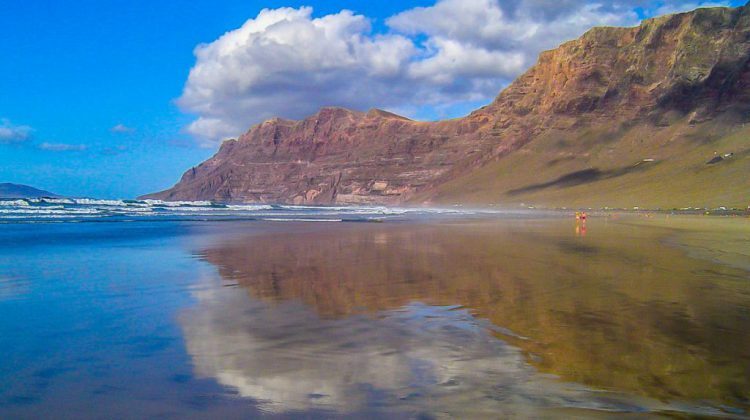 There are two weeks of zouk retreat, you can either book for Lanzarote, for Fuertaventura of for both: it’s adjacent weeks and it’s only a boat ride away!! At Lanzarote, you can expect a much yoga based week. We stay in a small fisherman’s town, it’s quiet and basic. The beaches are amazing to do some surfing and walking in the volcanic scenery is great. At Fuertaventura, the program is more focused on dance. The area is more touristic and our stay will be a bit more luxurious: it even has a little spa! In this way we hope to cater for all We hope to see you all at the Canaries and zouk!! Thank you Willem for sharing your passions and let’s zouk! !